How many times have you truly seen ice cream be done differently? Think about it. When you go to the ice cream aisle, how many times do you really see a difference between the major brands? When you think about it, ice cream companies have been feeding people all over the world the same ten flavors of ice cream, year after year, and no one has done anything about it. That is, until Mochi Ice Cream came on the scene and changed the way that people look at their ice cream forever. One of the best parts of Mochi Ice Cream is that it took normal ice cream, and made it portable. In that respect, it’s unlike many other innovations that have ever come out of the ice cream industry. Because Mochi Ice Cream is surrounded by that sweet Mochi dough, it’s a self-contained sweet treat that you don’t have to put in a bowl. That’s just one of the reasons that Mochi reigns supreme as one of the very best things to have ever come out of the ice cream industry. The way that Mochi changed the way that ice cream is perceived is through a traditional japanese dough that has been used to feed people for centuries. Mochi comes in many forms, and was used even by samurai, because it was known to be both lightweight and filling, making it great for long expeditions. 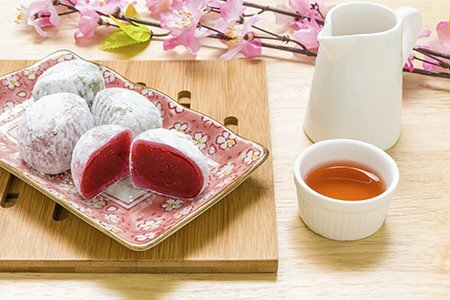 It had been used in making treats by the My/Mo company in order to make pastries for over one hundred years before it was used to house premium Mochi ice cream. Once it was discovered that you could use a sweet form of Mochi in order to house ice cream, the bakery skyrocketed into being an international sensation. One of the ways that Mochi has most profoundly affected the international ice cream community is through the introduction of the sweet mochi dough, which had been perfected as a recipe over the course of the hundreds of years that My/Mo used it in their pastries. Through that dough, not only did they make an ice cream treat that’s portable, they also made one that perfectly balanced the sweetness of Mochi ice cream. Mochi is the ice cream alternative that gives you all of that sweet, creamy goodness from ice cream itself, with a sweet rice dough that perfectly balances the equation and makes the ice cream great. Through innovative flavors such as red bean and green tea, Mochi has made ice cream experiences exciting and new again, instead of making them unfathomably boring by serving up the same ten flavors or so. Mochi has changed the way that the world has perceived ice cream for the past century, making it a top contender for the biggest innovation that the ice cream industry ever experienced. It all started with a simple idea: that if you perfectly balance the flavor of that ice cream with a sweet rice dough, great things will happen. From there, the world has accepted it as one of the most wonderful ways that you can experience ice cream.